There’s snow on the hilltops, which means here at Valhalla, we’re wrapping up another successful heli-logging season! High up in the remote BC forests lies a world that few people get to see. Our pilots feel very fortunate to have such a unique view of our bountiful environment. We’re proud to be an important part of BC’s sustainable forestry economy. Because heli-logging is a little-known industry, we‘d like give you a little peek into our high-flying relationship with the trees! Blessed with an abundance of this important natural resource, British Columbia is the world leader in standing-stem helicopter logging. Praised for its minimal impact on the environment, heli-logging is used in particularly remote areas where creating access roads and other logging infrastructure would be too detrimental to the wildlife and topography. It also allows for selective harvesting, eliminating the need for clear-cutting, and accelerating regrowth in harvested areas. Along with helicopter pilots, a variety of professionals are involved in the process of heli-logging. A team of forestry technicians, including engineers and surveyors, take a lightweight copter out to find the best timber – large, hardy logs that can produce a significant return (so that fewer trees need to be cut down for the same quantity of lumber). Later, a flight full of pros arrives to do the felling (cutting down), bucking (slicing up) and rigging (safely cabling for flight) of the chosen trees. Sometimes, our pilots are involved in the actual felling of the tree as well – the trunk is partially cut, and then a “choker” cable is attached to the tree and to the helicopter drop line, allowing the pilot to pull the line at an angle to safely break the stem away from the stump. Once the logs are ready, our bigger helis are called in for “vertical extraction”. As the pilot hovers, the riggers snap the ends of the choker to a special hook on the drop line, and the timber is lifted out of the area and flown either to an assembly point that is readily accessible by existing roads, or to a waterway collection spot. The logs are loaded onto trucks (or arranged in a flotilla) and sent on their way. Oh, and we do fly back to “extract” the technicians, too! All of this work is done within WorkBC guidelines, to ensure that every member of the team is safe, and that the logging is done to the highest industry standards. 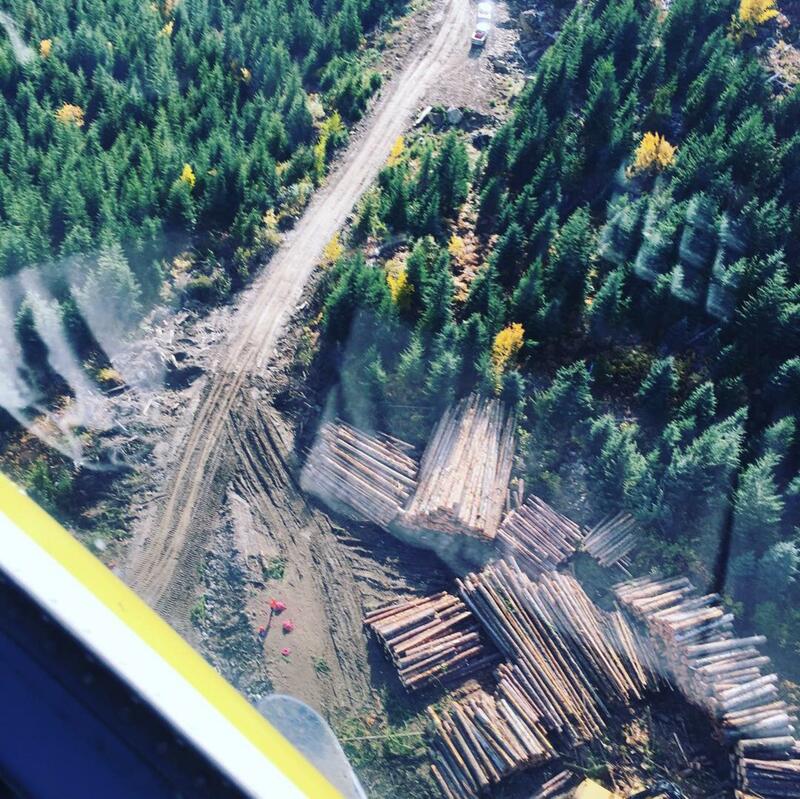 Heli-logging allows the timber industry to safely cut trees from steep areas, remote locations, and terrain that would otherwise be inaccessible because of potential damage to surrounding structures or power lines. It causes less erosion and damage to the surrounding forest, and less destruction to wildlife habitats. Here in BC, timber companies are choosing heli-logging over conventional logging for the significant benefits to workers and to our precious natural landscape. Timber is an essential, renewable resource in our modern world. Here at Valhalla, we want to do our part to make sure that it remains an industry on the “cutting edge” of forward-thinking environmentally-sound practices. 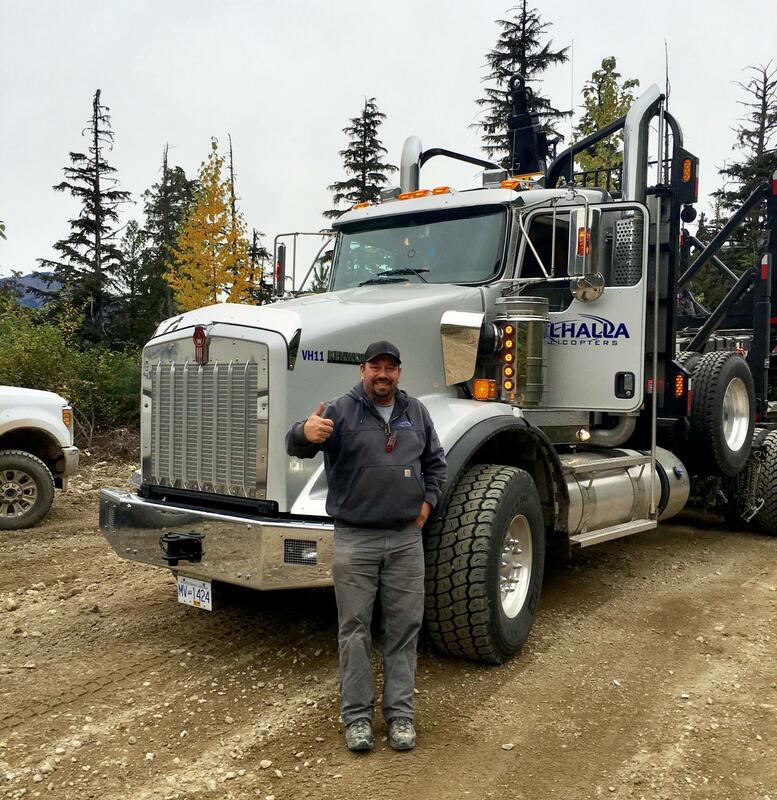 Learn more about Valhalla Helicopters’ heli-logging services, and our other commercial operations.